substances can be mixed into the water. Then it can be observed whether they go through the water cycle with the water or whether they stay behind. 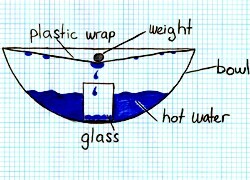 The water cycle can be easily recreated in a truly easy experiment. Pour the hot water into the bowl then place the small glass in to the middle of the bowl. Cover the bowl with cling film and place the weight into the middle of the cling film above the glass. Place the ice shaving on to the cling film and spread it so it covers the top. Now you have finished setting it up you can watch the process (it can take a couple of minutes). The hot water will start to evaporate and rise until it hits the cling film. 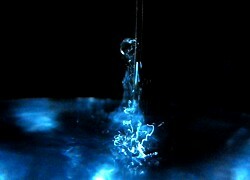 It water will then condense causing small water droplets to form. If you used the ice shavings it will speed up the condensation process. The small water droplets then slowly run down to the indentation made by the weight. At this point more and more little water droplets gather until a big enough water droplet forms and it will drip down into the small glass simulating precipitation. When water evaporates it leaves behind some impurities such as salts and metals. That’s why rain water does not taste salty even though a lot of the water comes from the oceans. easiest way to do this is by tasting it, but if you do decide to do so prepare the experiment as you would prepare food. Usually experiments should not be tasted, but when they are responsibly and knowingly prepared for ingestion then it is O.K. Learn more about the water cycle. Go back from the 'Water cycle experiments' to the home.